Review on Ysneakers x Astell&ASPR sneakers as designed by Yuri. Back in July, it was announced that Singaporean footwear brand, Ysneakers, was collaborating with Astell&ASPR to release limited edition shoes designed by several members of Girls’ Generation. The members participating in this collaboration (Taeyeon, Sunny, Hyoyeon, and Yuri) have designed 2 sneakers each – a low top and a high top. When these limited edition shoes were released in August, I quickly bought myself a pair of Yuri’s low top sneakers because it appealed to me the most. The shoes are packaged in a heavy black box and come with wooden shoe trees embossed with Yuri’s name on it. The box also contains a product guarantee and warranty card, a signed card by Yuri, a photograph of Yuri with a handwritten message, and a velvet dust bag. The sneakers are predominantly white, with a dash of gray suede at the heel counter. 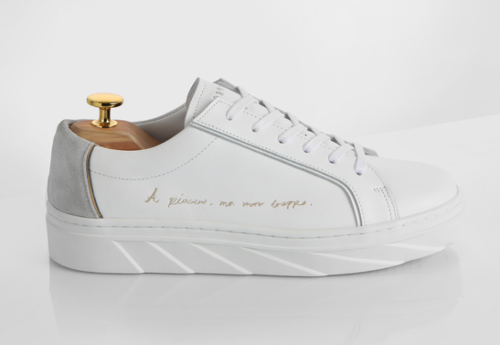 Additionally, the side of the shoe features an Italian phrase embossed in gold. The tongue of the shoe also has an engraving of Yuri’s birthdate. The suede at the heel counter, coupled with the Italian idiom on the side, makes the shoe stand out from any other white sneaker. Moreover, the colour scheme of the shoe makes it classy and elegant. Some might find the shoes to be a bit too basic, but in my opinion, the simplicity of the shoe allows it to complement any outfit. One of the perks of this shoe is the slight platform at the bottom. Because I am short, the platform is great because it gives me that extra height and a boost of confidence, which is always needed. Another strong point from a practical point of view is that these sneakers run true to size. These shoes are only available for purchase online and usually, I am a little apprehensive about buying footwear online because each brand has its own sizing. So, I was pleasantly surprised to find that these sneakers are accurate in terms of its sizing. Another great feature of the shoe is the quality. The sneakers are quite heavy since they are made of water resistant Italian calf leather. This makes the shoe perfect to wear even on rainy days. Despite the considerable mass of the shoe, it is not uncomfortable to wear nor is it weighty at all. Heavy shoes tend to be taxing and inconvenient because more effort is required to lift your feet up when walking. However, this is not the case with these particular sneakers. In fact, the shoes are decently comfortable, albeit the leather is rather stiff when the shoes are first worn, which is only natural. For me, the tongue of the shoe edged and gnawed into the flesh of my feet at the beginning which left some visible red marks. However, after a few more wears, the leather started to soften up, and the shoes became quite comfortable. I am also very prone to blisters but these shoes did not give me any at all. The best way to avoid blisters when wearing these sneakers is to pair it with high socks. As mentioned earlier, this shoe is predominantly white. One of the downsides is that it does become dirty easily. Another drawback is the price, as the shoe retails for US$349. Although the price is not exorbitant when compared to luxury labels, it is definitely on the costly side, especially considering that neither Ysneakers nor Astell&ASPR are famous brands. Some might argue that the shoes are relatively simple, which does not warrant its high price point. Nevertheless, it is important to note that the sneakers are handmade and crafted by the brand’s shoe artisans one at a time, so the extravagant price could be attributed to the shoe’s high quality. All in all, if you are in the market for new shoes, you might want to consider purchasing these sneakers since they are unique, comfortable, and practical. A bonus is that the shoes will constitute part of your collection of Girls’ Generation memorabilia, as it certainly is for mine! These limited edition shoes are available for purchase here. You can take a look at the shoes designed by the other Girls’ Generation members here. 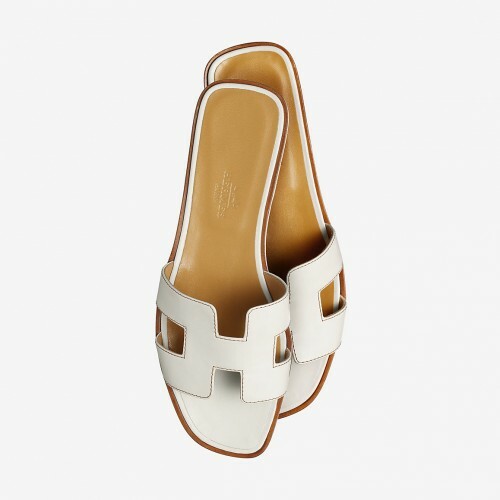 Review on Hermès’ Oran sandals as seen on Jessica. Jessica is no stranger to Hermès, given that she has been seen spotting numerous of its handbags. Today’s review is on what is arguably the brand’s most famous footwear – the Oran sandals. The Oran shoes are flat slip on sandals with the tiniest bit of heel at the back. It features a distinct ‘H’ motif at the top. The ones Jessica wore on her recent trip to Bali are made of calfskin and feature a leather sole but the shoes come in an array of materials and colours. The most popular colours are white, black and gold, but the brand does come out with multicoloured seasonal ones as well. A strong point of the shoe is how elegant it looks. Despite being a sandal, I love that it does not look atrociously casual. In my opinion, it gives off a rather classy and stylish vibe instead. This is probably due to the fact that the shoes are made out of leather. If you are looking for a sophisticated alternative to flip flops, these sandals could be a possibility. If you are looking to purchase these sandals, I recommend buying a size up. Unfortunately, I bought these sandals on a whim and did not fully get to try them on before purchasing. I bought them in my regular size but find that it is too tight at the top and consequently, my pinky toe occasionally rubs against the leather ‘H’ portion of the shoe. This has resulted in me getting blisters on the sides of my feet, which explains why I don’t wear them often. However, I do think that buying a size larger would rectify this issue as I have friends who find the shoes comfortable. A personal drawback is that the tiny wooden heel at the back of the shoe makes quite a bit of noise. The click clacking noise is especially noticeable when walking down the stairs. Although a minor gripe, it is something to take note of. Albeit Hermès is world-renowned for its leather, I was shocked at the relatively low quality of the sandal. I’m a loyal Hermès girl and I have been impressed with the quality of their other products so far. Although I only purchased my sandals around two to three years ago and rarely wear it, the leather lining of the shoe has started to rub off at the edges. I can only imagine that with more wear, there will be more tear. Another issue that inevitably comes with every Hermès review is the price. The ones Jessica wore currently retail at $680 and this price will fluctuate depending on the type of material. For instance, the suede versions of the sandal has a price of $790. These are exorbitant price points for mere sandals! Something to take note of is that Hermès has the tendency to increase the prices of their bags every year, although I am unsure if such policy applies to their footwear as well. All in all, unless you have the money to spend, I would not recommend buying these particular pair of sandals. Albeit tasteful, the quality of the shoes do not warrant its high price point. These sandals are definitely not a must and I can assure you that cheaper alternatives exist. You can browse through the different variations of the sandals and purchase the ones you like here. The members of Girls’ Generation are often seen at the forefront when it comes to discussions about the marketing and trending effects idols have on consumers, both in Korea and abroad. I’m sure many of you have been influenced into either making a purchase or debated a purchase just for the fact that it was either worn, advertised or used by one of the members. I’m guilty of this when it comes to the tech they make use of, as being the only male member on the team…many of the fashion items they wear just aren’t made for me. However, this being a camera review, this is right up my alley, and something I hope many of you read should you be interested in snapping pics like Yuri did during Channel SNSD. As mentioned before, the members tend to be very trendy when it comes to both fashion as well as technology. The Nikon J5 is no different, being Nikon’s newest mirror-less camera as of it’s release date of April 2015. 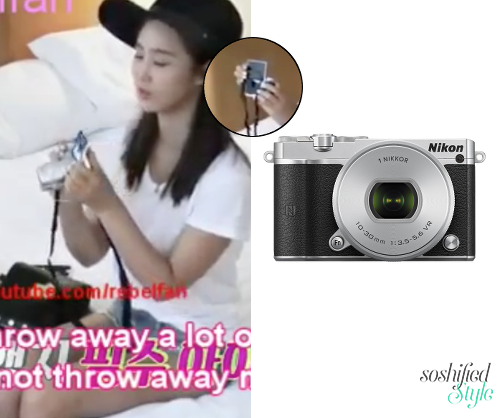 With it’s small size and good image quality, it’s no wonder Yuri made use of it on the show for her paparazzi-esque needs, and that many other reviewers and sites gave it high-marks. Given Nikon’s track record, this is not surprising. It’s a very good camera. But it does have it’s downsides, and a few of those may be enough of a deal breaker to warrant passing over the model. There are a lot of benefits too, and I’ll start with what makes this camera good. For some, size is the biggest factor. Not everybody has hands large enough(or enough arms strength) to comfortably hold a Canon 1D with a 70-200 f/2.8 USM IS II. Much less, not everybody needs to do that in the first place. Some people just want something they can fit in their purse or bag and take with them for those shots when a camera phone just won’t cut it. And the Nikon shines great in this regard. Weighing in at less than .5 lbs/.23 kg, it’s far lighter than a bulkier DSLR like the Canon 7D or the Nikon D7100, even if you factor in the lens. Much more, this is something that will fit into a purse or bag without issue, while those models require a dedicated camera bag or a large backpack. For some people, that’s enough to convince them this is the model for them. Nikon offers a variety of lenses to suit ones purpose, and whether you need a wide-angle lens to capture Singapore’s Marina Bay in all it’s grandeur or a zoom-lens to nab that shot of Tiffany waving during a Phantasia concert(and I do envy you if that’s the case! ), there are lens that will do that. Add on the ability to record 1080p at up to 60fps(think of the fancams! ), and you’ve got a very versatile camera in your hands. Or bags, purse, what have you. And whatever images you do capture, you can rest assured that it’ll be leagues better than what a cellphone is capable of. Despite the slightly larger footprint compared to say an iPhone 6S+, the photo quality will make you happy that you brought it out to handle picture duties instead of Apple’s flagship. Much like the iPhone, it also has WiFi capabilities, so you can transfer images from the camera to your computer without the hassle of finding your memory card reader or having to ever take the memory card out of the camera. Useful? I’d definitely say so. Adding in all of my previous praises, and you can see that there’s certainly a lot going for it, and rightfully so. Downsides? There’s not many, but they do exist. A big one to mention is although there are a few lens for this type of camera, they are dwarfed by the amount you can find for regular Nikon D-model’s. Many camera rental places will stock these newer models, but you’ll not have the same variety to choose from. Another issue, this one may be specific to K-pop fans/concert goers, is that although it’s fairly small, it may not pass the criteria that it’s not a professional camera, and you may not be allowed to take it in to certain events or venues. If you just plan on using it for fun, this isn’t an issue, but if you’re looking to be the next fansite master, you may have trouble getting this one in. Speaking of fansites, that brings me to my next con. The quality you get will exceed smartphones, no question about it. But it’s not quite up to par with larger dSLR’s. For most pictures, you won’t notice much of a difference. However if you are a fan of concert photography, comparing your low-light shots from the J5 to the larger models fansites use, and you’ll see they managed to get clearer and overall “better” pictures. Of course, their camera was about 4x heavier than yours and tens of centimeters longer, but it’s still something to note. Lastly, battery life is a little on the low side. It’s rated at 250, which is likely enough for a standard day-out, but if you are somebody that thinks they’ll take it to a lot of events and will be snapping away for hours, or wants to do a lot of fancamming, you may have to invest in another battery to be able to make full use of it over a long time period. Well, there you have it! I apologize if any terms I used were too technical or need more explanation, and I’ll be happy to answer any questions left in the comment section or clear things up. Overall, this is a great little camera that many people will find is just enough for them, but may not be suitable for power users or those that crave the most powerful camera on the market. Still, for it’s size and the price, I’m going to go ahead and recommend it, giving it a rating of 4.5/5. Thank you again for reading, and hope this helped any of you on the fence about buying! Review on Adidas’s Superstar shoes as seen on Hyoyeon and Sooyoung. You’ve seen it on Tumblr. You’ve seen it on Instagram. You’ve seen it on Hyoyeon and Sooyoung. Maybe you’ll see it in your shoe cabinet? What am I talking about, you ask? I’m talking about the ever so popular Adidas Superstar shoes! The Superstar is a sneaker created by giant sportswear company Adidas and is one of their most well recognised sneaker due to the prominent three stripes that signify the corporation, making it one of their most classic footwear. Despite being created in 1987, it is safe to say that the shoes only gained widespread popularity at the beginning of this year, particularly among teenagers and those who are fashion conscious. With this new found fame, it is without a doubt that these shoes have shown up literally everywhere – most particularly on social media platforms where teenagers most frequent; such as Tumblr and Instagram. Is the shoe actually worth the money? What contributes to it’s high profile greatness? Let’s take a look. The sneaker is very minimalistic. The only distinct feature it has are the three stripes at each sides of the shoe. It is primarily white, and the stripes differ in colour depending on what colour you choose to get. Due to its minimalistic look, the shoe matches with almost everything. One can wear the shoes with pretty much any type of outfit, and one would still look put-together. The style of the shoe is rather unique. Some sneakers have the tendency to be quite flat at the top, making the overall shape of the feet and shoe rather awkward. However, these particular pair of sneakers have the right amount of bulkiness, encompassing the feet in a subtle and flattering manner. Although I mention bulkiness, the shoe isn’t actually all that bulky and is quite portable – it is just like any other sneaker. Moreover, the shoe sits right below the ankle, allowing for an even more flattering look to any outfit. Another great element to the shoe is that it’s unisex! It is not limited to a specific gender and anyone can rock it – showcasing once again just how versatile this pair of sneakers are! A large factor that results into its stardom is the comfiness. This is without a doubt one of the most comfortable pair of sneakers I own. The shoe is snug and there is sufficient cushioning. Occasionally, I wear these shoes to go sprinting. The cushioning is enough for the soles of my feet not to hurt, in stark contrast to the Onitsuka Tiger Sneakers, which hurts the sole of my feet when I perform any type of sports. Although I do not know how the Superstar fares when running for long periods of time, but for sprinting, the cushioning is definitely thick enough. Furthermore, the shoe does not need any breaking in and I have never encountered any blisters while wearing the Superstar. I have worn these shoes countless of times now, and I have encountered two problems, albeit not very major. The first problem I encountered is how quickly it becomes dirty. Since the shoes are primarily white, it will inevitably become dirty easily and quickly. The Superstar I have is the exact same as Hyoyeon’s and I have coffee stains on it among other blemishes. I have not attempted to clean the shoes yet so I cannot comment on how uncomplicated or strenuous the process is. However, this is not a major problem since in my opinion, the dirtier the white shoe is, the more unique it becomes. The second problem I encountered has to do with the bottom lining of the shoe. After a few wears, the lining of the shoe started to rub off. As I am typing this, the lining of my shoe has rubbed off to the point where it became a nuisance, and so I removed the entire lining on both sides. This isn’t a vital issue, but since the shoe is manufactured by such a well renowned company, I expected the quality to be better. I find these pairs of sneakers to be on the reasonable side in terms of price. The shoes retail for $80, a price significantly cheaper than sneakers made by competitor brand Nike. In my opinion, the price tag of the sneakers can be justified with all of it’s merits as detailed above. All in all, I believe these shoes are worth opening your pockets for. You can browse through the different variations of the shoe and purchase the ones you like here. Review on Céline’s Trapeze Bag as seen with Sooyoung. Many of Céline’s bags have long been overshadowed by the infamous ‘Luggage‘ tote. For those who want a ‘rarer’ and more exclusive bag yet still very practical, read on as Céline’s Trapeze might just be the bag for you. The bag comes in either full leather or half canvas, half leather, or pony hair. Most usually opt for the bag to be in a mixture of both leathers, myself included, simply because it makes it somewhat lighter. The middle part of the bag where the flap is, is usually in leather and the winged sides, which arguably Céline made famous, is in canvas. The bag also comes in a huge range of colour combinations. You can get in a solid one colour or you can have it bi-coloured or tri-coloured. My Trapeze is tri-coloured in burgundy, maroon, and in a light brownish grey. The bag comes in either silver hardware like Sooyoung’s, or gold hardware. Made in Italy, the bag is very spacious, one of the most spacious bags I own. There is a long zip which stretches on until one of the winged sides when you open the bag. A flap in the inside of the bag which has two pockets, a narrow, vertical pocket and right next to it, a wider horizontal pocket sits nicely. At the bag of the back sits a zipped compartment. 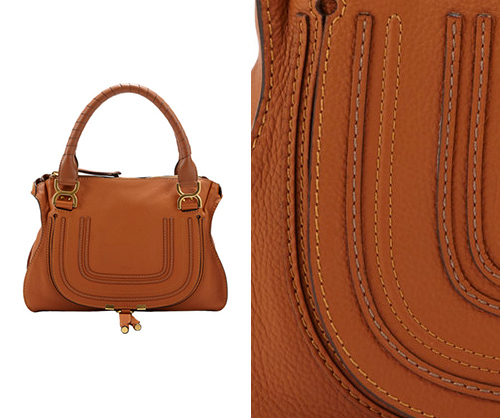 One of the best features featured in this particular bag is the removable shoulder strap. This allows the bag to be either a tote bag or a shoulder bag, courtesy of the removable strap! Personally, I like to use this bag in areas where pick pocketing is very common. This is one of the ‘safest’ bags I own simply because it takes quite a bit of effort to open the bag. First, you have to flip the clasp down, twist the buckle horizontally to the correct side, and the bag finally opens! This feature of the bag has both its pros and cons as some might find it quite a bit of hassle. In my opinion, the bag is considerably light as compared to my Hermès bags. However, wearing the bag on the crook of my arm does ache after a while and also gives me red marks. To be honest, I don’t quite remember how much I bought the bag for but a little bit of researching tells me I would have bought it for around $2600 in Fall 2013. As usual, Céline has marked up their prices now and as of May 2014, the Trapeze bag starts at $2950. The bag is quite expensive however I do prefer the Trapeze as compared to other similar priced bags like Saint Laurent’s Sac Du Jour Tote. Unfortunately, Céline does not sell it’s products online yet. Head on over to the official website to see the colours they offer for the Trapeze this season. 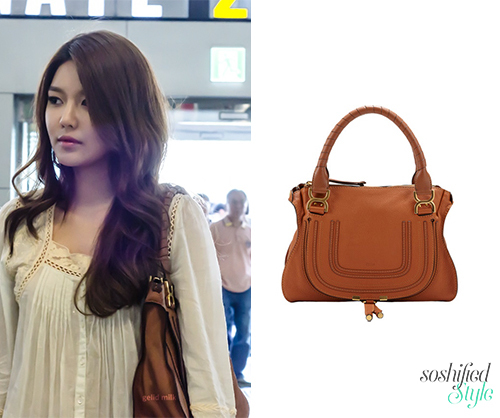 A review on Chloé’s Marcie Medium Satchel as seen with Sooyoung. After a full inspection of my Monday morning package that was all I had to say. From the first time I laid eyes on the Marcie I knew I had to have one and of course with the sale season in full swing I managed to nab this beauty with 30% off. Two of the main features that drew me to the Marcie for me were the: supple grained calfskin leather and sophisticated satchel design thus making it one of my favourite go-to bags. 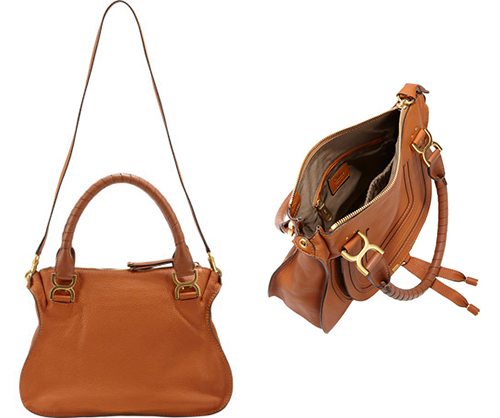 The Marcie is not a heavy bag and the colours that Chloé offer are easy to pair with many outfits. Though a relatively new bag to my collection, I have used the Marcie quite a lot since I purchased it last month and so far the leather has shown no wear yet. Made in Italy, the feel of the leather is quite soft almost like the feel of butter yet durable. Even though the colour (I purchased – Red) is one that can easily stain, none of my clothes (in particular my jeans) have rubbed off on the bag nor has it darkened. The images can only show so much but I was extremely impressed with the workmanship put into the bag through the raised stitch accents, wrapped handles, gold hardware and the concealed closures. When actually handling the bag, you can really appreciate these details and understand the pricing behind the Marcie (or in my case justify why I spent so much on a bag). Admittedly the bag was bigger than I expected but to serve everyday purposes it fit the bill. As measured the bag’s dimensions are approx.11.50″ height x 14.25″ width x 4.25″ depth, and easily fits my phone, sunglasses, keys, water bottle, iPad, wallet, make-up and notepad. It won’t fit a laptop so you would have to get the Marcie Large for that. The interior contains a patch pocket which easily holds your phone and a zip welt pocket to hold any small nicknacks you don’t want to lose. The bag has 2 handles, the leather wrapped carry handle and the shoulder strap. The shoulder strap fortunately is detachable so if you want to use the bag as a tote you can remove the straps. What I also really like about the bag design and shoulder strap is that you can carry the bag on the side as well as a cross-body bag. When using the carry handle, I find that it sits quite comfortably on my wrist and my inner elbow and won’t dig in harshly into my skin as other bags do. The bag truly is a fine example of good craftsmanship and quality. It is a beautiful bag that offers the perfect size and finishing touch to almost any everyday casual outfit. It is highly likely that I will purchase another one of these in another colour (perhaps Sooyoung’s lovely tan one) however the price is quite bothersome. Weighing it against other bags that are around the same price, personally I would prefer to buy other bags such as Saint Laurent’s Duffle 6 Bag than Chloé’s Marcie. My advice get it on sale or at a discount. You can purchase Sooyoung’s Chloé Marcie bag from here. 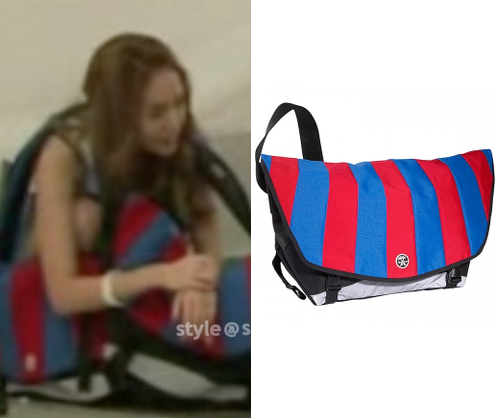 Review on Crumpler’s Messenger Bag as seen with Jessica. A very popular brand in South East Asia and Australia, Crumpler first started as a brand solely dedicated to messenger bags. However, they are now also known for their laptop carriers and camera bags. I will be doing a review on their classic and iconic messenger bag. The messenger bag comes in different colour combinations and sizes. I have the biggest sized one and it is very spacious. Even if you have a small one, the bag can still fit plenty of stuff. This makes it a perfect choice for students, myself included. Once you tend to put a lot of items in, the bag does becomes slightly bulky. The bag weighs in at 0.9kg (1.96lb) with nothing in it, for the large sized. Like all other shoulder bags, it does hurt your shoulders after awhile. However, there is an adjustable and removable shoulder pad, which is rather comfortable. In addition, the length of the strap can be adjusted to fit your height. The bag fits my 15″ MacBook Pro perfectly, still with plenty of room. However, the bag does not have a specific compartment for the computer itself. The bag has plenty of compartments for other essentials though. It features two small pockets in each side of the bag, a zipped compartment in the middle front, and a velcro compartment right behind the zipped compartment. This messenger bag is a very ‘safe’ one as well. One of the most important features of this bag is the safety reflective strip at the bottom of the bag. This is a feature especially important for bikers. It has two closure straps which can prevent pick-pockets from stealing things too quickly. The bag also has two velcro seals for when you open the bag. This then makes quite a bit of noise. Regardless, the velcro might be rather annoying to some, but it does help in preventing and helping one be aware of pick pockets. The quality of this bag is superb. The bag can be used for heavy duty activities which is probably why it does not get worn out easily. I have many Crumpler messenger bags (more than 5), and I can assure you, they will last you for a very, very long time. Some might abominate this specific bag, but pair it up correctly with the right clothes, and no one will ever call you out for being embarrassing. Personally, I find the bag slightly tough and manly, but I still use it nonetheless. The colours that come with the bag are catered towards the men and not the ladies. I have not seen many women carrying the bag, but it is and it can be unisex despite it. In my opinion, the bag is not particularly expensive. It is a very casual bag which can be used for school, everyday use, whatever! It does last you a lifetime and is definitely worth the money. Although the bag is sold out for now, check out the different colour combinations of the bag here.